That pizza can GET IT. Do good people make better food? In the movies it seems like the really talented chefs are all insufferable pricks. Mean, petty and vicious. 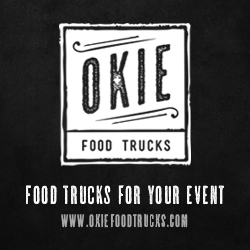 And I’m not saying that Oklahoma chefs are all angels, but most of the ones I’ve met are at least pretty nice and they care a lot for the people in the kitchen. And then there’s Matthew Heard, owner and chef at The Heat (née Humble Pie), who is so incredibly kind and sincere that you worry someone told him you were dying and he’s just trying to make your last moments on this planet enjoyable. Watch him walk around the restaurant. There are no strangers. The night I was there, he checked on every single table himself, sharing jokes, making conversations and thanking them for their patronage. Notice the dollar bills hanging from the ceiling? Those decorated dollars were matched by Matthew and sent on to O.A.T.H. — Oklahomans Against Trafficking Humans. He’s a sweetheart. 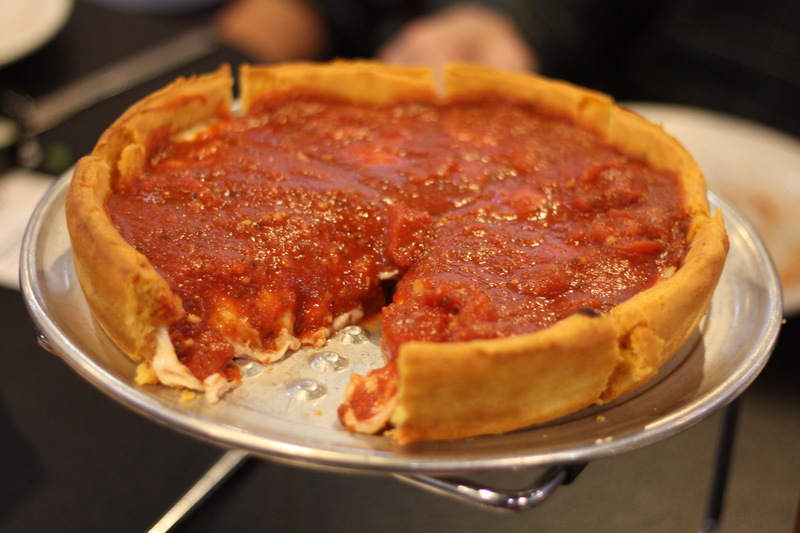 And he just so happens to make a really good Chicago-style deep dish pizza. 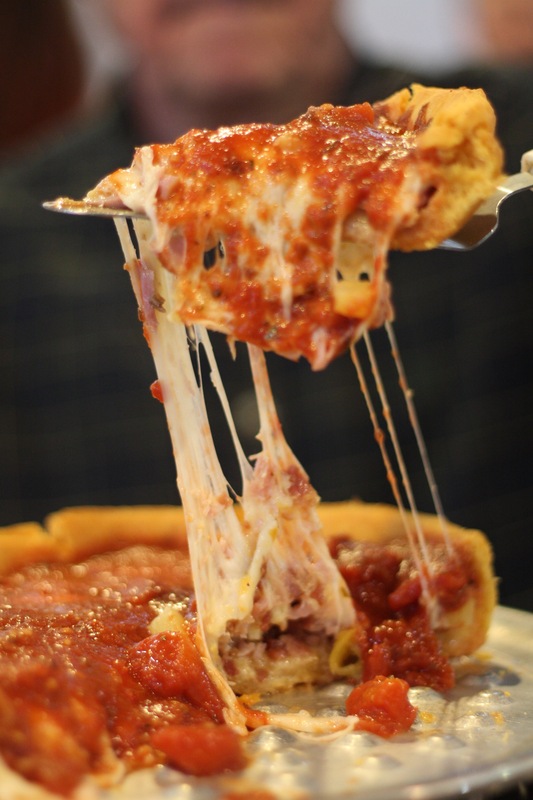 According to one of my favorite comedians, a prince of a man named Kyle Kinane, the only time people in Chicago eat deep dish pizza is when they have relatives visiting from Los Angeles. And maybe that’s true. I still happen to think it’s delicious and The Heat’s take on the iconic dish is a winner. If you’re going to The Heat for the deep dish, and I heartily recommend you do, then I implore you to look over this menu before you go. Cool, then I hope you don’t go too hungry, because a Chicago-style pie take roughly 40 minutes to bake. Or you could check out the menu now, figure out what you want and order it ASAP when you get there. Which isn’t to say there aren’t appetizers and ways to pass the time pleasantly. But if you’re going specifically for the pizza, it’s good to know what to expect. One thing you can always expect when going to The Heat with me is seeing The Death Star ($7.95). I can’t not order it. 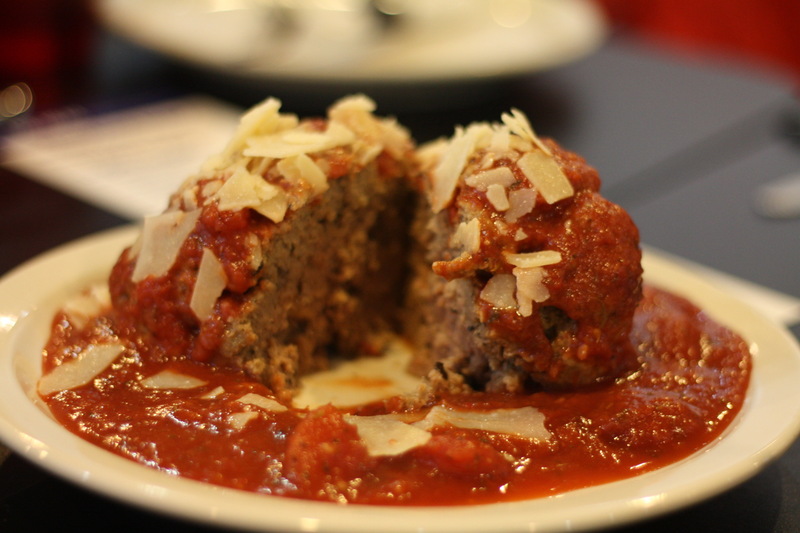 The Death Star is a one-pound meatball covered in chunky red sauce and topped with shaved parmesan. ::extreme Vader voice:: Luke. Get a load of this meatball. Witness the firepower of this fully armed and operational meatball. The most amazing thing about it is how moist and tender it is. You can slice it with a knife and dole out pieces to everyone at the table or just go at it with your forks in a mad dash to eat. One way or another, it’s an excellent choice. And yet the ability to destroy a small family’s hunger is insignificant compared to the power of the pizza. A deep dish pizza at The Heat starts at $15.49. Each topping adds $1.60 to the price. It’s a good option if you like your pizza straightforward and simple. But the combos are pretty outstanding. Virginia is for lovers, but Oklahoma is for Meat Lovers ($23.49). 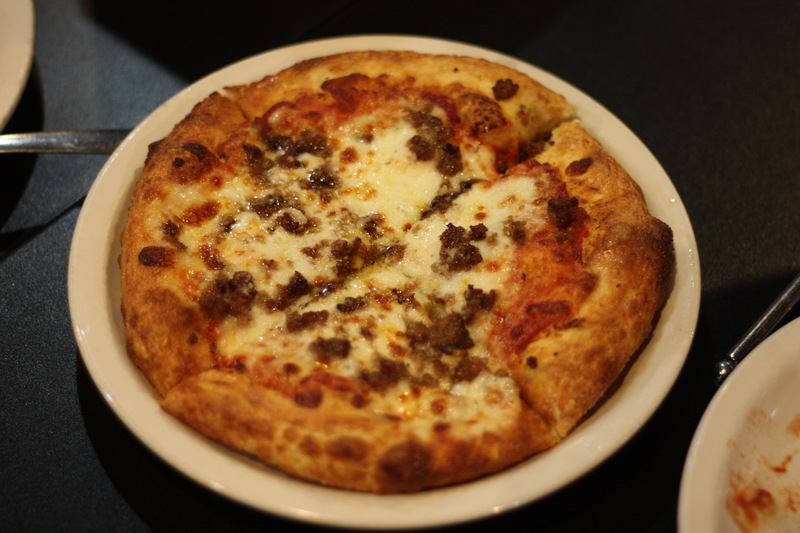 You’ll be smitten with a blend of pepperoni, house-made Italian sausage, bacon, ham and summer sausage laying on top of a blanket of melted cheese, all covered a hearty layer of The Heat’s red sauce. Sauce on top, like a gent. That’s because the long baking time would mean rubbery or burnt cheese if it were sitting on top. The crust is also something completely different. It’s a lot more like a savory pie crust than one made with pizza dough. It’s buttery, with tons of layers, which gives it crispiness that soon gives way to a tender, melting quality in the mouth. This pizza mixes applewood smoked bacon with Canadian bacon and pineapple under the house red sauce. Any attempts to eat this without utensils will end in your humiliation and a hefty dry cleaning bill. For pizza that comes a bit faster and is more like what your kids are used to, go for the excellent hand-tossed pies. Prices range from $7 for a small to $16.49 for a large with toppings extra. Or get any of the combos on a hand-tossed crust. We went simple, partially because I like to taste the ingredients and partially because my children are terrible and refuse to eat anything but “meatball” pizza. We got them a small with Italian sausage and it was goooood. Nice crispness on the dough and a good chewy pull. That’s a hard balance to get right, but The Heat nails is. My only problem with the restaurant are the hours, because it means my dreams of sneaking in for lunch to enjoy a deep dish pizza to myself are kaput. 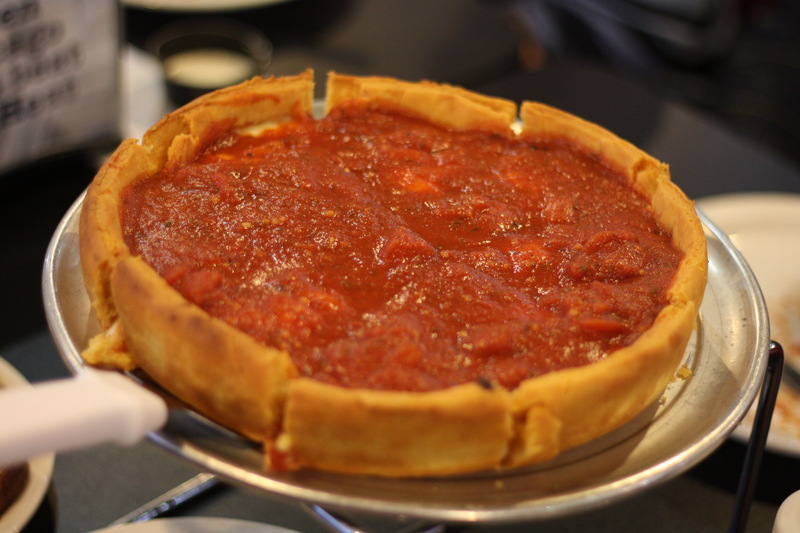 Still, so long as The Heat keeps making the best Chicago-style deep dish in Oklahoma, I’ll keep going back again and again and again.